Tom's shoes is a very cool concept of sharing and giving and a great way for them as a company to show their charitable side. They don't do it in an in your face way. "For every shoe you purchase Toms will give a pair of new shoes to a child in need"
It is also interesting to note how high merchandise is marked up in the clothing industry, they were able to make 2 units of the same product sell only one and still profit. Major clothing companies should learn a lesson from this if they havent already. 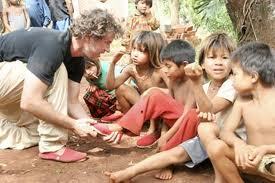 Similar to Toms shoes in a sense they make shoes for charitable pruposes. The JoJo project is a bit more hands on. After you "choose"(purchase) you then "Act"(pick one of the two enviormental charities) after this you can then "Check" the progress of your charitable donation. The charities you can choose from are Tree Nation 1 pair = 1 tree planted, and The water project 1 pair = 1 year of drinking water for one person.